Livestrong Travel: Templo Mayor, Mexico | News. This is a piece I wrote for Livestrong Travel on one of my favorite cultural destinations: Templo Mayor in Mexico City. Me at Templo Mayor in 2010. At first glance, Templo Mayor, in the bustling Zócalo area of Mexico City, looks as though it could be a site under construction, but it is actually one of Mexico’s greatest ancient treasures. Built by the Aztecs in the 1300s and rediscovered in 1978, the Templo Mayor, once a grand pyramid housing two temples, now sits in ruins, level with one of the world’s most populated cities. The site offers visitors a closeup of its ancient past and with many surrounding cultural sites, it’s one of the best places to get a look at Mexico’s past and present. The archaeological site itself continues to be unearthed by archeologists. Visitors can walk through parts of the site and view the treasures discovered so far such as the Wall of Skulls and Temple of the Frogs. Archeologists are still digging further down into the pyramid discovering new clues to the Aztecs’ mysterious past. Many of the greatest finds are on display at the adjacent Mueso de Templo Mayor, which at the time of publication is open Tuesday through Sunday with a small admission daily except on Sundays. 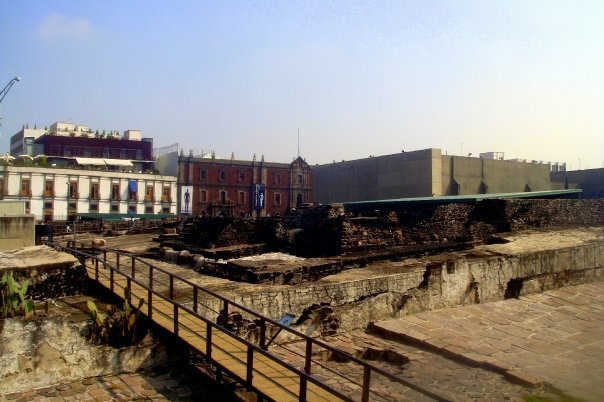 The 17th-century buildings surrounding the archaeological site in The Zócalo tell the story of the beginning of modern-day Mexico City. The Plaza de la Constitución is one of the three largest public squares in the world and is surrounded by numerous churches, government buildings and cafes along the cobblestone streets, all accessible from the Zócalo exit of the Metro. One could easily spend an entire day attempting to explore all the sites within a few city blocks of the area. The center’s main building, The National Palace, offers a colorful look at “Mexico Through the Centuries” a mural by one of Mexico’s most famous artists, Diego Riviera. The immediate area surrounding Templo Mayor is rich with some of the most interesting displays of Mexican culture. Several art and history museums area short walk from the site, offering an up-close look at Mexico’s colorful past. For the art enthusiast, Palacio de Bellas Artes (Palace of Fine Arts) (palacio.bellasartes.gob.mx) is a must. The grandiose looking building with golden dome and statues outside houses the works of some of Mexico’s most famous artists. The museum has a rotation of exhibits regularly as well as permanent installations that include works by Diego Rivera, among others. 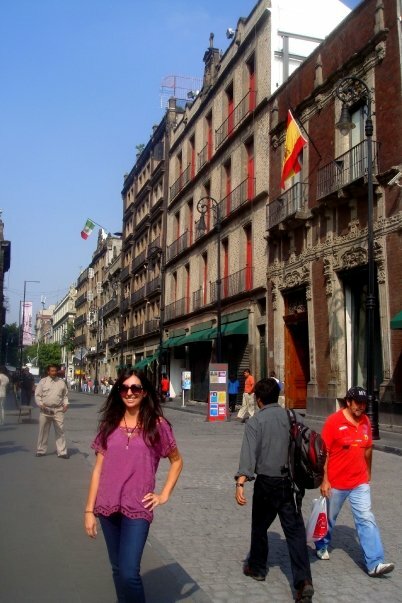 Seven blocks west of the Zócalo is the best place to shop for locally made souvenirs while also walking among history. The Aztecs once held their markethere, as did the Spaniards, during which access was only permitted to the wealthy. Today, the market is full of vendor tents offering everything from textiles to pottery as well as a taste of local cuisine, and is open to the public daily, with live music on Sundays and holidays. The park also offers a wide field of grass for play, benches to rest and a white-marble monument of Hemiciclo a Benito Juárez greeting visitors from Avenida Juárez. Dee Anna David-Ortega is an independent editorial and marketing professional. She has been a writer and editor for more than a decade, working with publications such as “Latina,” “944 Magazine” and the “East Valley Tribune” in Arizona, as well as the Center for Digital Ethics at Loyola University Chicago. Tags: Culture, mexico, Mexico City, Mexico D.F., Templo Mayor. Bookmark the permalink.